It’s voting day, and this flyer appeared on various utility poles near 16th and Mission this morning. Beware the wiles of mustachioed ladies. Are we really okay with a one-eyed King? Say wolverines, or badgers, scratch through the low window, behind the Hydrangeas. Or a possum. Or an opossum? Either way — they’re still inside the house. If dolphins were larger, would they have old tires stuck around their heads, instead of old six-pack rings? Tracking polls indicate near universal acceptance of [argument]. We need to get back to defiling the native architecture. There sits one day in a place far away a little girl and her doll. And her doll could be at risk and her risk could be very real even if the doll’s imaginary friend ran for office. It’s like I said before. Your ship as come in, buddy! Stop fighting it. A voter walks into a bar. He — and let’s just say it’s a he — sits down at a table. And let’s just say a gal comes over and sits on his lap. It’s a free country. What do you think, readers? 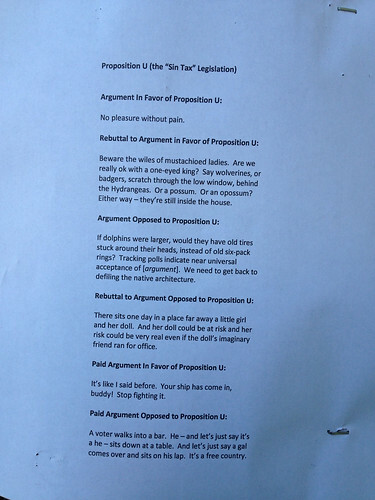 How are you going to vote on Proposition U?